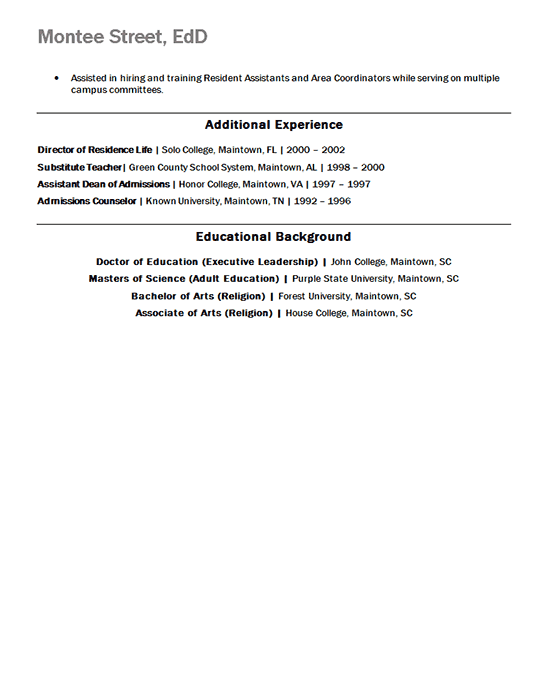 The Dean Resume Example is for a Doctor of Education that is currently the Dean of Student Affairs. The title includes a sub-title of three career roles that Montee has interest. 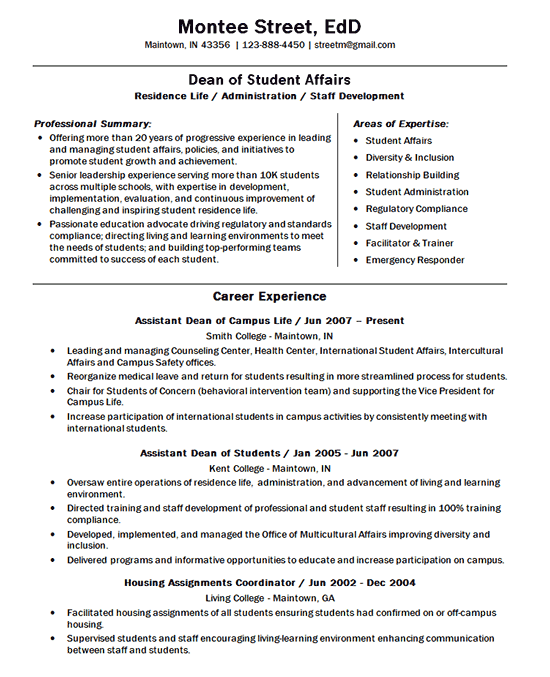 The summary is in bullet point to showcase his broad experience in student affairs, policies, and student management experience. The “Areas of Expertise” section contains keywords appropriate to his experience for a branding statement. The bullet points are mix of statements that explain his experience and accomplishments. This includes many of his contributions to student improvement. Page two continues to build on prior positions, additional experience, and closes with his Bachelor, Master and Doctor degrees. Offering more than 20 years of progressive experience in leading and managing student affairs, policies, and initiatives to promote student growth and achievement. Senior leadership experience serving more than 10K students across multiple schools, with expertise in development, implementation, evaluation, and continuous improvement of challenging and inspiring student residence life. Passionate education advocate driving regulatory and standards compliance; directing living and learning environments to meet the needs of students; and building top-performing teams committed to success of each student. Leading and managing Counseling Center, Health Center, International Student Affairs, Intercultural Affairs and Campus Safety offices. Reorganize medical leave and return for students resulting in more streamlined process for students. Chair for Students of Concern (behavioral intervention team) and supporting the Vice President for Campus Life. Increase participation of international students in campus activities by consistently meeting with international students. Oversaw entire operations of residence life, administration, and advancement of living and learning environment. Directed training and staff development of professional and student staff resulting in 100% training compliance. Developed, implemented, and managed the Office of Multicultural Affairs improving diversity and inclusion. Delivered programs and informative opportunities to educate and increase participation on campus.